I've been writing for publication for about fifteen years. I don't know why I began. Ego, perhaps, or self-satisfaction, or a sense of accomplishment. In fact, I sold the first article I ever wrote, a historical article about the little community of Aurora, Missouri which had the good luck, or misfortune, of being platted out on top of significant reserves of lead and related minerals. I've not become a household name since then, but I have published in some national venues, with most of my success coming from the personal essay, or creative nonfiction essays. 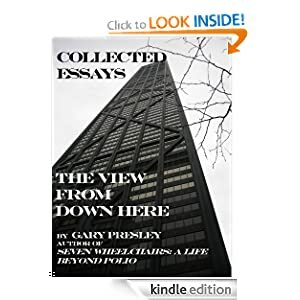 Many of the essays included in The View from Down Here have been published in other venues, but many of those published appear here in their original form, mostly meaning longer than the edited/published versions. So why now? Why Kindle? Ego, again, but also because I think that electronic publishing—digital books—will become more prominent as a medium for transmitting information. If that's the case, I want my essays in that form together rather than having them scattered throughout independent and unrelated archives. We have a Kindle Fire, one my wife bought without talking about the decision with me. She bought it to assemble a portable collection of children's books for the little person who lives with us. I have used it a bit, and it is easy to use, and it's especially colorful and realistic when reading a soon-to-be three-year-old a book like Pigtastic! The illustrations in books we've downloaded so far are static, but I suppose given the capacity of the device, we will soon see a merger of film and text. The View from Down Here has nothing so fancy. It has ten essays about life. If you buy it, I hope you'll go to the Amazon page and write a short review.